Chat with your Facebook friends without visiting Facebook. Now you can keep chatting from your desktop using Facebook chat client Chit Chat. 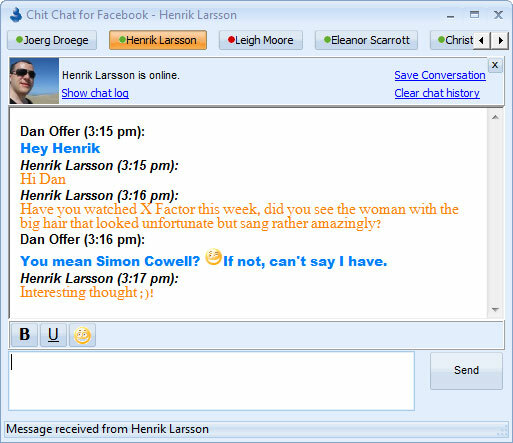 It is a free instant messenger which enables you to chat with Facebook friends. It has a very simple user interface. After installing Chit Chat you will be asked to enter your Facebook email ID and password then you are ready to go. All your online and offline contacts will be shown. You can change your status message or you can set music status. It notifies via sound when you get any message from your buddies. Various keyboard shortcuts are available to make chatting easier. 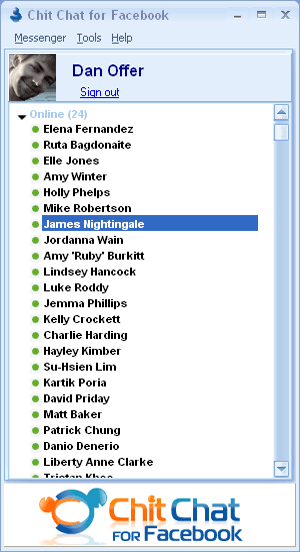 Tabbed messaging is available so that we can chat with many friends at the same time easily. This windows Facebook chat client has built in Facebook smiley support to make Facebook chatting more enjoyable. Chit Chat does its job very good, though I think the UI not that attractive like other instant messenger clients. Have you used Chit Chat? Please share your experience with us.